There’s no doubt that the food manufacturing industry can present a number of challenges for food manufacturers. From food contamination to belt stretch, manufacturers need to be constantly on the ball with regards to maintaining a clean, efficient and functioning system. And that starts with equipment. Downtime can be costly. Then there’s the potential reputational damage you could also incur. A cause of downtime is maintenance and efficiency losses due to roller chain drives. Roller chain drives present a contamination risk. They require constant lubrication with oil or grease which can contaminate your products and, beyond that, carry an environmental risk and ongoing cost to your business through unnecessary maintenance downtime. Food processing environments are subject to frequent washdowns to remove bacteria, germs and other contaminants, using aggressive cleaners and chemicals. These liquids can damage roller chains – meaning you need to fix them, or replace them over and over again. High moisture environments can also cause rust problems, which you definitely don’t need. The ravages of time also impact roller chains; in service, chain joints will wear, causing the drive to ‘loosen’, resulting in timing and synchronisation problems in food processing operations. Finally, there’s the location of your drives to think about; drives in areas with difficult access are more time consuming to maintain. And, since metal and chain components wear quickly, they have to be replaced more frequently. One immediate change that could be implemented is a switch from roller chain drives to belts, which offer numerous benefits and solutions to many of the common problems facing food production operations – helping you to meet production goals and save money. Gates belt drive systems are virtually maintenance free – no lubrication, no messy and expensive oil baths. Being maintenance free, they are designed for difficult-to-access spaces that would usually require disassembly, costly health and safety procedures, or the use of ladders or crawlspaces to get to for that maintenance ritual. Gates can provide belt drive components that don’t need to be covered prior to washdown; that’s because the polymeric belts such as Gates Poly Chain and stainless components are resistant to water and caustic chemicals. Equipment can be washed down in place, again reducing the time needed to maintain your system. Polyurethane belts combined with stainless-steel or nickel-plated sprockets and bushings are unaffected by most common disinfectants, bactericides, and cleaners used for washdowns. The aggressive caustic solutions used in food processing plants have no effect on Poly Chain belts or stainless-steel sprockets and bushings. Gates belts rarely need re-tensioning and do not stretch over time. Gates offers a variety of belts and components suited to food manufacturing environments. • Clean-running, high-powered polyurethane belt drive alternative to roller chain. • No slipping, 3X longer life than standard roller chain, virtually maintenance free. • Ideal for low-speed, high-torque drive applications. Conveyor applications. • Sprockets, sheaves and bushings available in stainless steel. • Nickel-plated sprockets also available. • Ideal for aggressive washdown environments. • Engineered to handle transverse bending and twisting. • Unique under cord construction for optimal flexibility. • Gates patented Flex-Weave cover. • Power turn conveyor beds. • Designed with teeth on both sides of the belt to provide synchronisation from each driving surface. • Equal load capacity on both sides of the belt. • Suitable for serpentine applications requiring rotation reversal in some driven shafts. Conveyor applications. • Designed for 1/4 turn or twisted drives where more than an O-ring is required. • Power turn and line shaft conveyors. • Line includes long-length belting, Twin Power belts and spliced belts. 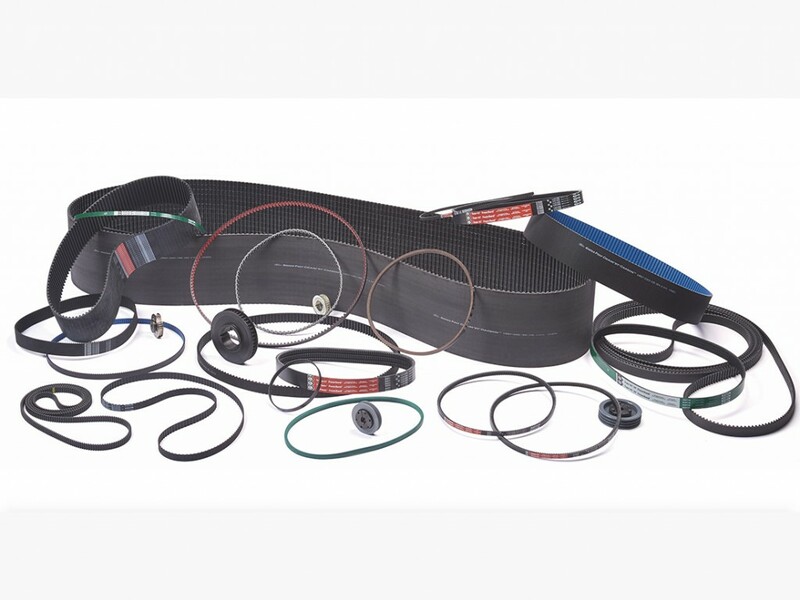 • Wide variety of belt materials, constructions, and backings available. • For food conveying, washdown applications, and antibacterial conveyors. • Micro-V profiles can be provided as backing for synchronous belts for applications that require synchronization on one shaft and have the ability to run an alternative shaft off the back of the belt as in flour mill applications. • Low durometer option with higher friction coefficient for applications that must convey packaged materials up inclines or transfer fragile food products (e.g. packaged potato chips). • High strength, low stretch polyurethane belts designed specifically for the food processing industry. • Clean-in-place convenience for washdown environments. • Reductions in downtime, wastewater, and maintenance costs.